Dashmote, a Dutch Artificial Intelligence startup that helps companies analyze visual data to discover trends and gain valuable market insights, yesterday won a Digital Top 50 Award in the category B2B startups. 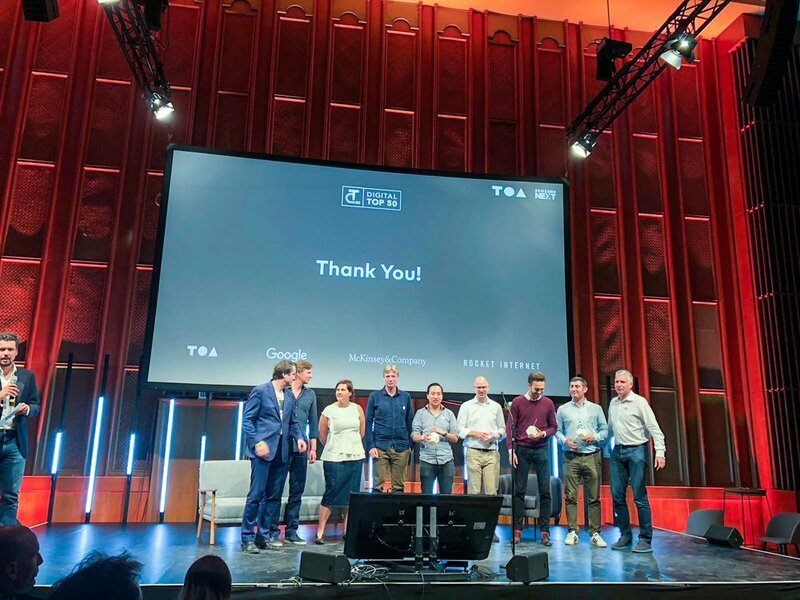 Google, McKinsey, and Rocket Internet joined forces with Tech Open Air Berlin, held from June 19 – 22, for the 2018 edition of the Digital Top 50 Awards (DT50). Ten Top 50 nominees battled in each award category during this year’s edition of the festival. Dashmote ensures that B2C companies in FMCG, fashion, food & beverages, and consumer electronics are on top of their game thanks to its proprietary technology based on Artificial Intelligence offering visual trend analysis and market intelligence. With the help of Dashmote’s visual analytics platform, companies can discover trends and market insights much faster, which in turn expedites product development and marketing. Dashmote, founded in 2014 by Dutchmen Dennis Tan (CEO), Stefan Tan (CFO), and Austrian-born Matthaeus Schreder (CPO) currently serves well-known companies as clients, namely Coca-Cola, Heineken, Unilever, and Philips, from its headquarters in Amsterdam and satellite offices in Vienna (Austria) and New York (US). “For us, this award is the acknowledgment of all the hard work we’ve put into Dashmote in the past three years. With our business model for the past year and a half – discovering trends and market insights with visual data – we have been quite successful, securing large clients and growing the team to 20+ employees. We, as a team, feel that this award is an homage to all of our supporters, clients and the growth of the European entrepreneurial ecosystem”, Dennis Tan, CEO, and co-founder, comments. “With Dashmote, we have a great winner in the B2B startup category of the Digital Top 50 Awards. What we as the jury liked from a broader perspective is that Dashmote aims for new frontiers in the field of marketing, trying to bring analytics, AI, and images together. We believe Dashmote is reaching for a very interesting, scalable market at the right time, with the right technology, and a great team,” says Karel Dörner, leader of the McKinsey Digital Labs Europe. Dashmote had the honor of being invited to the exclusive Dragon's Den hosted by Heineken and the Innovation Summit in Utrecht. It was an evening of startups pitching their ideas for innovation scouts from Heineken IT/Supply Chain and commerce department. It was a 2 minute pitch followed by a 5 minute Q&A and was described by Stefan Tan as "a great way to participate and talk about the innovation that we can bring to Heineken." Dashmote – a group of high tech innovators that bring Artificial Intelligence to image analysis for Marketing Intelligence – was recently selected by the Dutch Government to participate in the Xplore US scale up expansion contest. The contest – from RVO and commissioned by the Ministry of Foreign Affairs – gives innovators the opportunity to pitch their US scale up business plans and expansion strategies to a Jury to win participation in a ten-day accelerator programme. The programme is hosted by kTeams (an MIT spin-off for international companies) and includes accommodation in Boston and travel from the Netherlands to Boston and back. Congratulations Dennis and Dashmote Team. I am convinced you will be on your way to become the next Instagram and more! Partnerships between big established companies and startups are not that uncommon but providing innovative solutions is something that is very hard to achieve. Nonetheless, we are excited to announce that we have partnered with PostNL to offer to the customers of the innovative Drukwerkservice access to over 300 million stock images. The users of Drukwerkservice can now create their offline promotional campaigns from idealization to the final delivery in the post box of their target audience on one platform. The Dutch national Post is known for its appetite to build innovative solutions and this why in a time when all the attention is focus on digital advertising, they have created a tool that focuses on offline advertising. An area which is less crowded and traditionally was available only to big players with big budgets. Druckwerkservice offers to small and medium companies an alternative to reach out to prospective customers and experiment with new acquisition channels. Give it a try here and select the perfect image on the special dedicated Dashmote page. Amsterdam, 3 May 2016 - Amsterdam-based startup Dashmote launched on Product Hunt their open beta after being unexpectedly “hunted” by Uber Developer Experience lead and ex-Googler, Chris Messina. Competing against Beme -- an app founded by Youtube sensation Casey Neistat, which holds $2.5M in funding, and more than 50000+ on Google Playstore and iTunes downloads -- Dashmote put up a fair fight. Although Beme was ranked number one at the end of the day, Dashmote finished the day with the most upvotes, receiving more than 650 upvotes. Product Hunt, founded in 2003 by Ryan Hoover and backed by Y-Combinator, is a website which enables users to share and discover new products. With approximately 6.6 million monthly visitors and more 150.000 registered users Product Hunt has become an integral part of any startup’s marketing strategy due to the strong community of early adopters and like minded people. As of 5th of May 2016 Dashmote has received 800 upvotes surpassing, fellow dutch startups Revue 2.0, Blendle and Bundle which received 752, 562 and respectively 399 upvotes. Founded in december 2014 by Dennis Tan, Matthaeus Schreder and Stefan Tan Dashmote is on a mission to make sourcing the visual content as easy as possible by bringing together free & paid high-quality images from the largest visual content providers and delivering them to you in one easy-to-use platform. AMSTERDAM, 12 October 2015 - Dashmote was selected out of more than 700 applications to join the e-commerce accelerator program at Startupbootcamp Amsterdam. Over the upcoming 3-months, we will collaborate with 150+ mentors, partners and investors to build a world class product with the ultimate goal to become an industry leading sustainable company. A great opportunity, as Dennis (CEO and co-founder), said: “We are joining because of the unique mentor network and we intent to grow the team skills and our business at lightening speed. Startupbootcamp will accelerate our growth as we could have a thriving environment to bring our business & team to the next level.” This pressure cooker and network will allow us to improve the product and give our consumers instant access to all visual content in an even faster speed. As Patrick de Zeeuw, co-founder of SBC, said: “As long as you are open and willing, together we can shorten your road-map and accelerate your business”. And that is what we at Dashmote are totally ready for to start doing now: bringing our customers a search platform where they have access to all visual content. Founded in 2014 with a rebellious spirit and a lofty objective by Dennis zs. Tan and Matthaeus Schreder, Dashmote is on a mission to combine the best sources of visual content. By combining together in one platform the best micro, macro, and authentic stock image providers, they are able to deliver a comprehensive search and collaboration tool for the creative world and not only. An entrepreneur since the age of 15, Dennis z.s. Tan has participated in the creation of over 25 companies and is an international public speaker. He is the co-founder of multiple entrepreneurial groups including Dutch Entrepreneurial Communities, Erasmus Centre for Entrepreneurs Student Association and involved in various European organizations such as Think Young, the European Confederation of Junior Enterprises and FACE Entrepreneurship. AMSTERDAM, 07 October 2015 - Dashmote signs first official partnership with INGImages, giving its users access to another 4 million carefully edited professional royalty free images. Consumers now save time, money and find more relevant images. A great start on the road map of Dashmote. Stefan, CFO Dashmote and responsible for partnerships: “INGImages is excited to work with Dashmote because they believe we will disrupt the visual content market by having an unique technology capable of growing the complete market which will benefit both parties”. It works as following: Dashmote is building a smart search with an so-called elastic search, that is connected with the APIs of the image suppliers. This is done through building an API-wrapper around their partners system to be able to call in the images. Dashmote operates in a market estimated at $4 billion where 500 million images are sold on a yearly basis. Images have a different meaning for different people, this is why Dashmote strides beyond regular keywords and simple visual recognition. Using a mixture of deep learning algorithms and a library of more than 120 million high-quality images, Dashmote is creating a platform which not only recognizes concepts and emotions, but combines them with user information, to generate highly personalized results. The current partnership brings Dashmote closer to it's goal of targeting each stock market segment, starting with the microstock images where INGImages is our first proud partnership. In the upcoming weeks another four partnerships are in the pipeline to be closed. AMSTERDAM, 25 March 2015 – Dashmote, an Amsterdam ­based tech startup that integrates specialized services and bundles that information for its users, announced today the company valuation and beta launch of its image search feature. Four months after its start, the company raised €450.000 of pre-­seed financing, with a post­-money valuation of €4.5 million allowing Dashmote to launch its first feature and start development on its mobile application. Dashmote is on a mission to bring inspiration and simplicity into everyday routines. By transforming the way people use the web, Dashmote unlocks creativity and cultivates curiosity. The search feature allows you, the user, to be inspired and connected. With the image search feature, users can search for a theme, compare all images on one webpage and share selected photos instantly. There is no need to browse different image sources any longer. Dashmote’s current partners include major parties such as Getty, Fotolia, iStock, Pixabay and Dreamstime. In the coming months, Dashmote expects to add niche services and tap into new social media image sources such as Instagram, Pinterest, Tumblr and Flickr, who recently joined as a partner. With the addition of three employees in March, Dashmote now has a creative and experienced team of 11 working in house and four supplemental freelance developers located around the globe. Currently in its validation stage, the company is able to realize long term plans and features. To join Dashmote’s beta testing, please visit http://beta.dashmote.com. For more information about Dashmote, visit http://presskit.dashmote.com. Dashmote is an intelligent, intuitive interface that gives you smart access to the web. Dashmote integrates specialized services and bundles that information for its users. Everything you need in one place. Founded in 2014 in Amsterdam, it is the brainchild of two curious rebels. For more information, visit www.dashmote.com. An entrepreneur since age 15, Dennis z.s. Tan has participated in the creation of over 25 companies and is an active speaker among the community. He is the co-founder of multiple entrepreneurial groups including Dutch Entrepreneurial Student Communities, Erasmus Centre for Entrepreneurs Student Association and involved in various European organizations such as Think Young and the European Confederation of Junior Enterprises. He is a board member of Lobulu Holding, KAJE Notebooks and ECE Students. Dennis studied Economics, Fiscal Economics and Public Administration at Erasmus University Rotterdam and studied abroad in both Asia and Northern America. He is an active philanthropist having participated in a 120km peace walk across Maasai Land, Africa. In his free time, Dennis enjoys music, art, food and all-things entrepreneurial.